*bump status: technically I am 41 weeks, but these photos were taken at 39 weeks. This is definitely one of my favorite maternity outfits so far. I think it's because I don't own a pair of regular gray jeans or a shirt in these colors, so it feels really new to me. As much as I am ready to not be pregnant, it has been really interesting having some new clothing items and incorporating them in new ways. 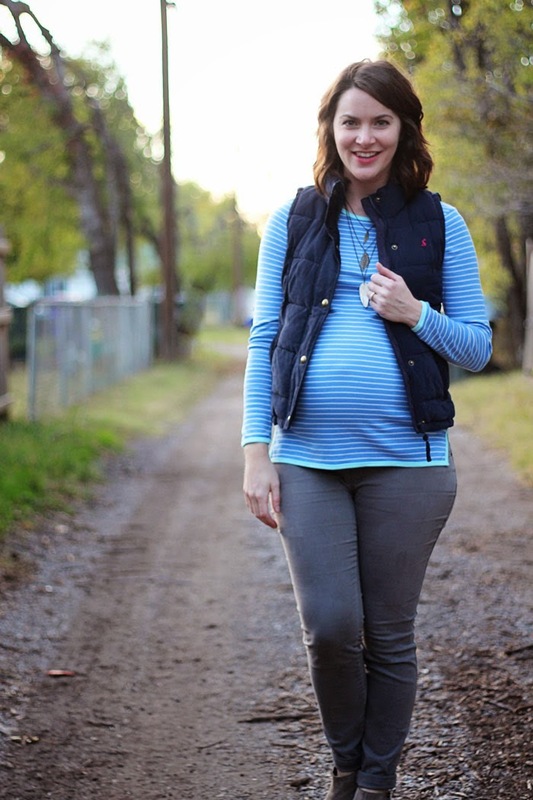 I've added a lot of things to my regular-clothing wishlist over the course of this pregnancy. It was sooo hard to stay away from all of the Black Friday/Cyber Monday sales this past weekend, but I am trying to be patient as I don't know what will fit/when. Also! It must be acknowledged that I finished all of Eric and I's Christmas shopping. Yes, all of it. Everything was purchased from the comfort of my home, in my sweatpants, while drinking tea. I freaking love online shopping. Throw in some cash-back from eBates, and lots of coupon codes and I feel like such a winner. love love love your vest! The inner lining is too cute! I love little hidden details like that. ...seriously, Baby S...where are you?!?! I'm ready for a cute baby to be in your arms in these photos. :) Praying for you, friend! 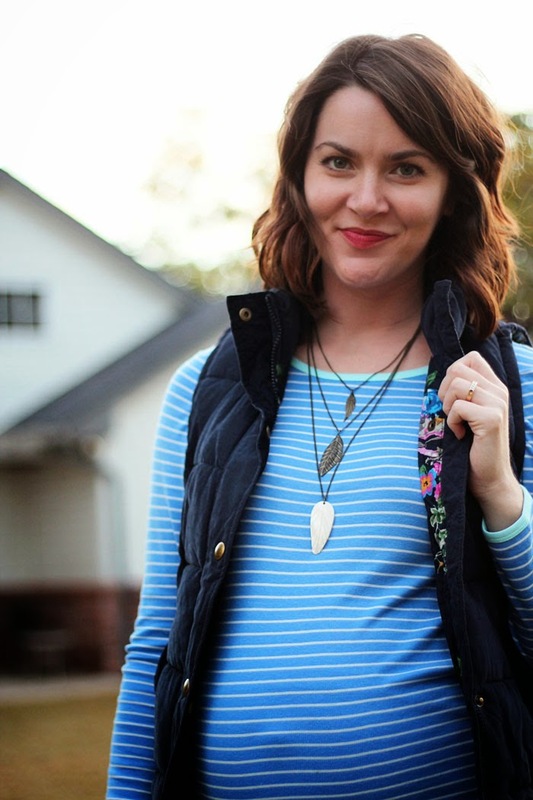 Love your layered necklaces! The floral lining of your vest is such a cute detail! Yay for online shopping! Good for you for getting all your Christmas shopping done!! Now you can relax and wait for baby (the phrase "relax" used loosely of course, because how can you relax at 41 weeks?!?!) He'll be here so soon, and he'll be amazing!! 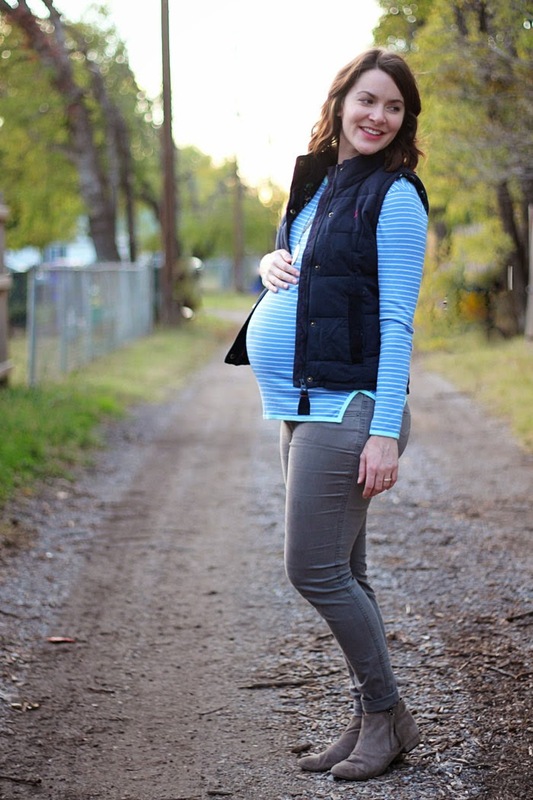 I agree with - I have some maternity pieces that I wish I had in non-maternity. Yay for finishing your shopping! I think I am done, too, and it feels so good! dear baby, join the world! Wow, congrats on the Christmas shopping! That is nothing short of a miracle in my book - I am a last minute kind of girl. I have such a hard time thinking of gifts, and then usually by the time I'm ready to buy it's too late to order them in time for Christmas. It's actually something I struggle with every holiday season. I'm totally in awe of people who can take care of it early. I'm getting so anxious to hear news about this baby! super cute outfit. i finished almost all of my shopping, i have 2 bottles of wine and 2 gift cards left, but i'm not worried about those. Love the color of these jeans! While I was sick of my maternity wardrobe by the end, I really did miss some of the great pieces I had that didn't have equivalents in my regular wardrobe... hopefully they'll still be "in" next time around :) So impressed that you got all your Christmas shopping done - definitely a smart use of time while you're waiting for baby. 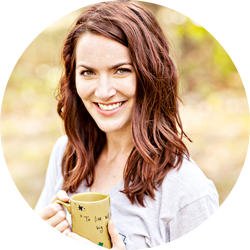 And whether pre- or post-baby, I'm with you on online shopping (with ebates!) in jammies. You are the cutest bump rocker I ever did see. :) Can't wait to "meet" that baby!!!! Very awesome outfit! I am 24 weeks and feel a little in a rut with outfits right now. I think it's I need to accessorize more! I love the necklaces you are wearing! loving the the lining on the vest so cute ! The lining of your vest is so pretty! 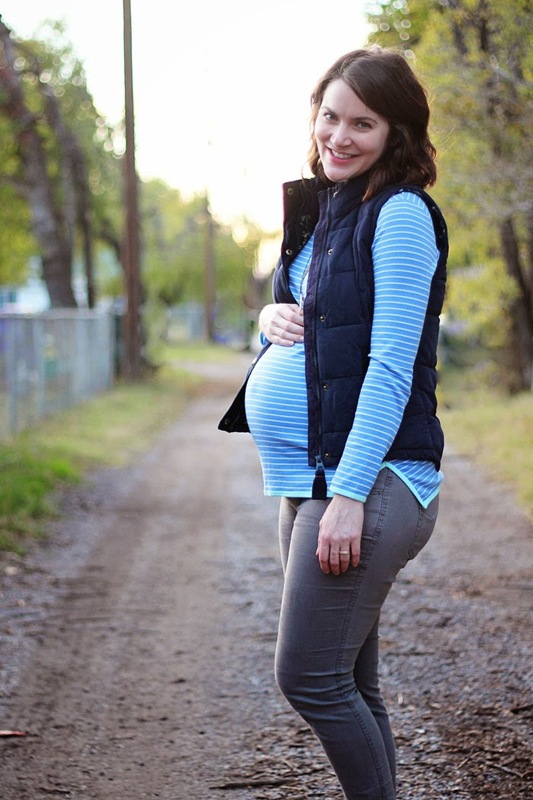 It is hard to keep from buying 'regular' size clothing during pregnancy. I totally splurged once I was back to my size. It is a great chance to take inventory and see what you really like from your maternity clothes and what you want in your closet because of that...or what you didn't miss and what you should get rid of! Lucky you to be done with Christmas shopping. I don't even know where to begin. I had hoped that I would be able to find a $2 DVD for everyone on my list, but when the only ones available were Sherlock Holmes and Harry Potter, I decided against that plan. Hoping your baby decides it's time to come join us soon! Stripes and a puffer jacket?! Love!